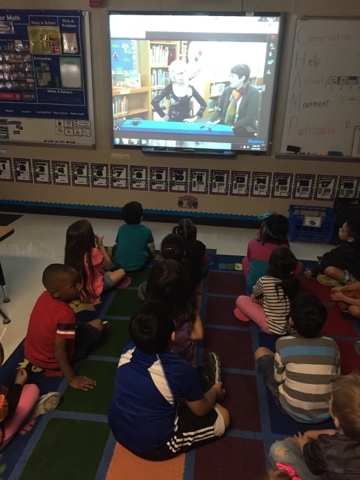 Thanks again to twitter, the students at my school were involved in another virtual author visit. This time with Kate DiCamillo. Last year, Jarret Krosoczka tweeted about a live event he was going to be doing. I sent the information out to the teachers and almost my whole school watched as he talked abot writing, illustrating and Platapus Police Squad. You can read about that here. 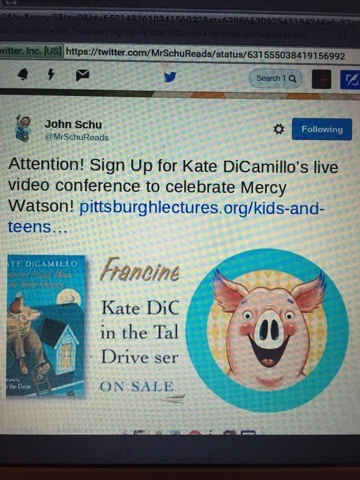 Back in August, John Schu @MrSchuReads, tweeted about a video conference opportunity in October with Kate DiCamillo. I immediately emailed my teachers about this awesome opportunity (even though we were not yet back in school from summer vacation)! When school did start, one of my kinder teachers asked if I had any recommendations for a read aloud to do with her class. I mentioned the Mercy Watson books and reminded her about the upcomming video conference with Kate. She jumped on the idea and started reading her kids book one and they were hooked! She would tell me that her kids LOVED the books and couldn't wait for the end of the day when she would read. They sat mesmerized, still and quiet while she read. They loved how Mercy loved buttery toast and asked questions about why Eugenia didn't like Mercy. She said in all her years of teaching kinder, she had never had kids respond to a book like that. So of course when she finished book 1, they wanted to read book 2. So they did. And another kinder class started book 1. Today, they came back from lunch and were so excited to see "Mercy's writer" on the screen and the books that they had read displayed behind her. Everytime Kate mentioned Mercy, they would gasp and giggle. They "oohed" and "ahhed" when she mentioned the "buttery toast". It was really something to be able to connect them with an author of a story they had just adored. Meanwhile, in 5th grade, more amazing things were happening. One teacher told her kids about the video conference and that they would only be able to watch the beginning of it since their lunch happened to fall right in the middle of it. Tonight on her blog, this teacher wrote "After I saw the expressions on their faces, I offered to have them get lunch from the cafeteria and come back to the room during lunch. They all had smiles on their faces!" She emailed me after school and said that her kids loved it. They had watched the whole thing and told me that they had eaten lunch in the room, and that it was the first time ever in her teaching career (21 years) that she had eaten in her room. Wow! The power of being connected! I love being able to find these opportunites for my students and it is only because I stepped out of my comfort zone and started tweeting that I became connected and in turn can connect my students and teachers.